Anarchy Online·:.· :. .· .Front·:.· : .· .Monthly Development Update · 29th of November, 2013 ·:.· : .· . Genele brings you the latest news from the AO team. Forum post can be found here. This month I am back with some very exciting news. After a long month of hard work, we have deployed a version to the new engine beta server for the first time! A small number of testers are already playing on the beta server, and as the testing continues we will get the ball rolling with more and more invites. We are starting gradually with the Closed Beta invitations. As a token of our appreciation, those who have signed up for 12 month Membership plans will be given the highest priority and those with 6 months plans the second highest. To make sure we get a good idea of how the engine will perform, we will also do invites based on specific hardware profiles. You can expect the beta invites to ramp up in early January after the holidays. This is a huge milestone for the AO team and we are very excited that we will finally be able to invite players to take a look at the new engine and NPE. I hope you will become as excited as we are when you see how Rubi-Ka looks like with a new pair of glasses. We have made a feature list for the new engine beta that we want to share with you, so you are aware of what to expect when you get your beta invite. Click here to see the full list of new and improved features. The winter season has started (Here in Montreal we had snow this week!) and in Rubi-Ka the celebrations will start the 14th of December and will last until the 2nd of January. This year we have added old school Christmas social items to all the loot folders of Winter Leets and the feared Kyr’Ozch Grin’Cha, who is back to ruin Santaleets gift shop factory. We will also meet Gingerleet which we have not seen for years and the Gift-Wrapped Leet has yet again stolen stuff from Santaleet and will be hiding under a Christmas tree in Borealis. 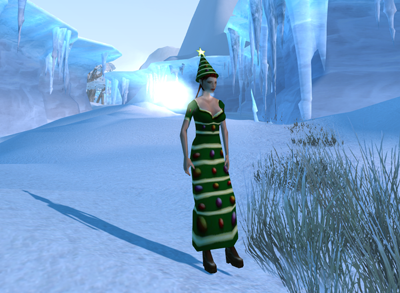 This year you will be able to find a brand new "Tree Dress" in the Christmas gifts. And the Item Shop will provide a free item for everyone and a free item only for subscribers! Thank you all for your patience and continued support. I am really looking forward to seeing many of you on the beta servers early next year! Happy winter holidays everyone!